Every year, in the US 5 de Mayo is the celebration most associated with Mexico. When I first moved here, it shocked me a little bit, as 5 de Mayo in Mexico really is a minor celebration. It’s not our Independence day (that would be September 16), it is not the Revolution commemoration (November 20th)… it marks a battle in Puebla when the Mexican army defeated the French invaders. However, as May 5th has been widely recognized here in the US as “Mexican” day, I’ll take the opportunity and celebrate my culture and heritage with tamales and stories . In the mid 1800’s in Mexico, the country was in turmoil. A young nation, Mexico had gained its independence from Spain in 1821, eleven years after Miguel Hidalgo called the Mexican people to fight to be a nation separate from Spain. By the late 30’s, the new Mexican government had amassed a large debt to some European nations, amongst which was France. A French pastry chef, who owned a bakery in Mexico City, complained to the King of France that his shop had been pillaged and wanted the Mexican government to pay for the damages. As the government refused, the King mobilized his troupes and established an economic siege on the Gulf coast shores of Mexico. This was the first French intervention, and it was solved by the government paying the baker what he wanted with the help of Great Britain’s help. Years later, the conservative arm of Mexican politics started pushing for bringing back the monarchy to Mexico. This, combined with Napoleon the 3rd wanting to make Mexico a puppet of his regime because of the American Civil war, made France want to get involved in Mexican politics. Thus the second French intervention came about. Here’s where the Battle of Puebla took place: on May 5th of 1862, a small and under-armed Mexican army stopped the French invaders and delayed their way to Mexico City. Eventually, the French did win that Battle and took over Mexico City, instating Archduke Maximilian and his wife Carlota as emperor and empress of Mexico. This only lasted for a few years, until Benito Juarez, president elect of Mexico at that time, and his army brought down the emperor and took back power. When the Spaniards conquered Mexico, the three most important crops for the Aztecs were corn, squash and potato. Cacao was considered so precious they used it as a sort of coin. The importance of corn goes back to the Mayans, and it is featured prominently in their myths and stories about the creation of the world and human kind. According to the Popol Vuh, the Mayan writing that encompasses their mythology of the creation of life, the Gods created everything, but they wanted an intelligent being to worship them. The first made men out of mud, but it crumbled. Then they tried wood, but it was hollow and the men had no heart. Finally, they decided to make men from corn dough. The Tamal, from the Nahuatl Tamalli, means wrapped or covered. A more extensive history of it can be found here. It mainly refers to any corn dough wrapped in leaves, mostly corn or banana, and steamed-cooked. The filling of the tamales can go from sweet to savory. Strawberry tamales are amongst the most loved with Mexican children, and they are bright pink and have raisins. A year ago I tried to make tamales myself for the first time, and found a recipe by Sonia Ortiz of fresh strawberry tamales. For this class, I modified her recipe very slightly, and used it again. The tamales are not bright pink nor have raisins, but they are slightly sweet and delicious. Place the strawberries in a large bowl and mash them with a fork or potato masher, until you get just some small pieces left. Add the pinch of salt and splash of vanilla, mix and let it sit. Soak your corn leaves in warm water so they become supple. Leave them in the water at least 20 minutes. With the butter a bit softened, add the vegetable shortening, sugar and baking powder. With an electric mixer and a wire attachment, whip until the mixture becomes fluffy and grows a little bit. Add the corn flour 1/2 cup at a time with a rubber scraper by hand. Then add the strawberry mixture and then the milk little by little. The remaining dough should be firm, and not fall from a spoon if you hold it out over the bowl. If your dough is too soft, use a bit more corn flour. Take a corn leaf in the palm of your hand and drop a heaping tablespoon of dough in it, covering the walls of the leaf with the dough. Wrap the leaf in a tamal shape. You can also use lengthwise sections of corn leaf to wrap the tamales with. You can see in my picture that is what I did. In the steamer, place a layer of corn leaves at the bottom of it. Place the tamales standing up, leaning against each other. Steam for about an hour, to an hour and a half, until the dough comes out clean from the corn leaf. 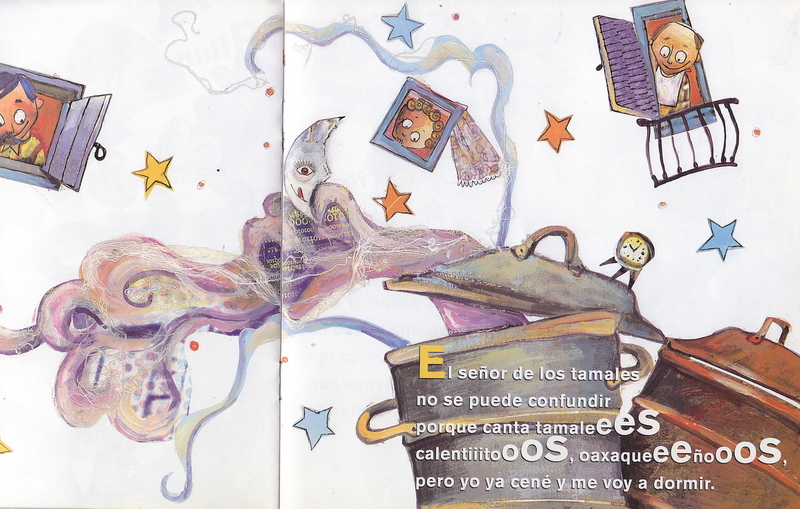 For this class, I wanted to review a picture book called Suena Mexico, or sounds of Mexico. All throughout Mexico, to this day, people go around the streets selling all sorts of things using town criers, and each place has their very special “cries.” This book gathers the most famous ones in Mexico City where I grew up. To this day, even in the most affluent parts of the city, you can still hear the afternoon cry selling tamales, or the pan flute announcing the kitchen knife sharpener. When my daughter was in preschool I brought this book to read to her class for Cinco de Mayo. Even if it is in Spanish, it’s super easy to translate on the fly and the drawings by Gabriela Podestá are really colorful and whimsical. Hope you enjoyed our little bit of Culture, history lesson and storybook! 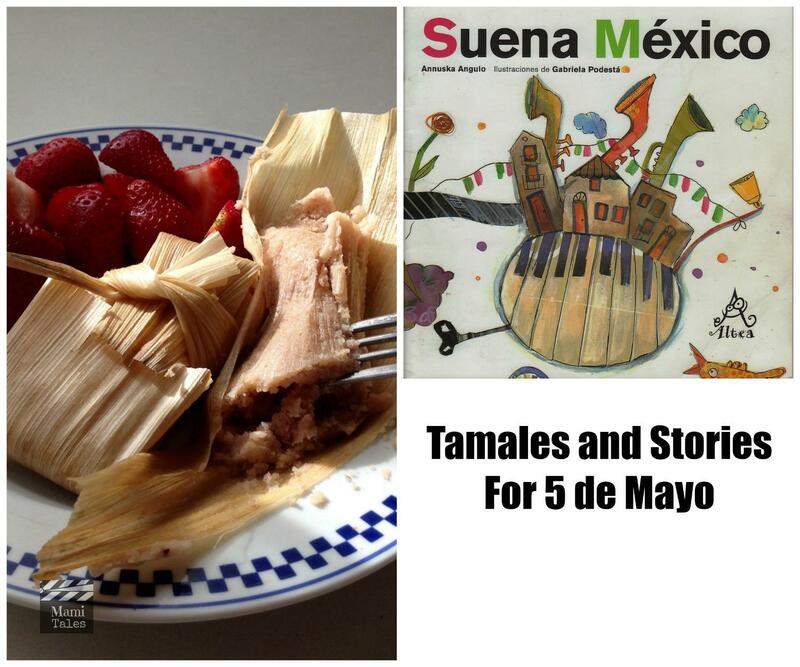 And for all of you out here in the US, happy 5 de Mayo with some Tamales and Stories! YUM YUM YUM!! Do you have any of the tamales left over?! 😉 Can i have them!? Unfortunatley they are all gone next time!! Hey Renee! I have to say that my Mexican friends were pretty pleased with the summary of Mexican history and 5 de Mayo, so I’m glad you found it informative too! You know I love mixing things up a bit, so a little history with a recipe and a book felt like a perfect combination! Mexican food (the real stuff) is absolutely delicious. I should have my brother (who lives out there in Vancouver) cook something up for you! He was working at a restaurant and they added his chilaquiles with chicken to their menu. About your tamales and campfire… I guess that as long as you have a very large pot with a steamer attachment, if should be doable. A little bit of a hassle to do is as campsite food as you have to soak the leaves in warm water to soften them up in order to wrap the tamales, but it can be done. Let me know if you do it! I’m totally going to try! Which restaurant did your brother work at? Is he still here? I don’t know!! I have to ask him. I guess something close to UBC. He’s still there, finishing his BSC in Chemistry. Thanks for teaching me something to day. I honestly didn’t know this history, and it’s so interesting. The tamales look great! So glad you found it interesting. Here in North America is a very common missconception that 5 de Mayo is Mexico’s independence day. And the tamales were indeed very yummy! Thanks for stopping by. Haven’t made my own tamales, but have eaten homemade ones. Going to try your recipe. Thanks for sharing on the Kid Lit Blog Hop.